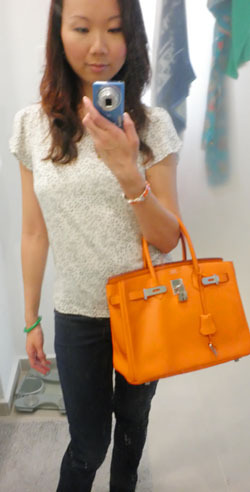 MY HERMES BIRKIN :) | Beverly's Net: family. food. fashion. MY HERMES BIRKIN :) – Beverly's Net: family. food. fashion. I don’t even really know how to start off this entry. “Hullo everyone, I got a birthday present from Chris”? I guess that’s about as good a way to start as any 😛 So yep, I got a birthday present! THE birthday present. The one and only bag that I’ve coveted for ages and considered the #1 bag to own. 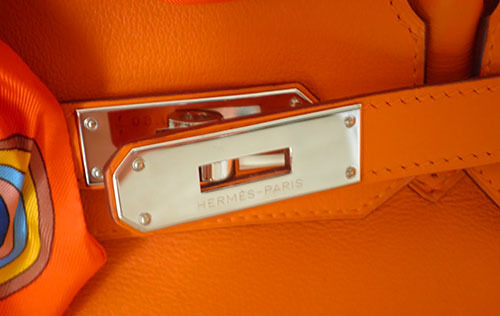 Specifically, the 30cm, orange, Swift leather, palladium hardware Hermes birkin. This article makes an interesting read on why Hermes bags are so highly desired, with unmatched quality and workmanship. If you’ve held a Birkin in real life, and stroked and sniffed it, you’ll know what I mean 😛 They’re pretty luscious! 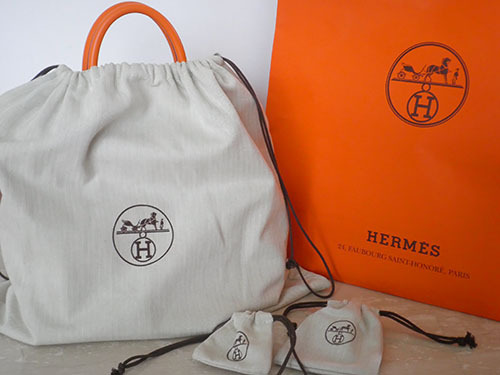 Actually, I never was into Hermes when I was much younger. But as I *ahem* aged through the years, my fashion taste developed/matured and I grew to like Hermes til the point that I adored the Birkin. It has ZERO visible logos to others, so isn’t very in-your-face, and the feel of the bag is simply divine. 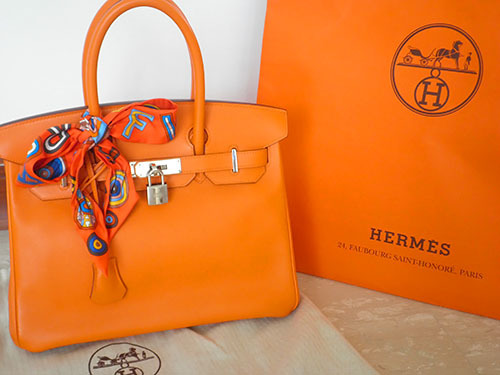 The only Birkin colour I wanted was the Hermes orange one, because it’s the best colour IMHO – stunning and a great statement colour. The only leather I wanted it in was in Swift leather, famous for being supple and soft. Can’t stand the other leathers because they just make the bag blah to me. And the only size I wanted was the 30cm, which I personally reckon looks best on my frame. And it was with GREAT DELIGHT that I uncovered my gift on my birthday, and it is by far my favourite bag. Bar none. None of my other bags even come close! Obviously, the Hermes Birkin will be passed on to our (future) daughter and will ‘match’ Chris’ Jaeger LeCoultre watch, which I gave him for HIS 30th birthday, which will be passed down to Hunter. My 2 favourite things. Which one do I love more? Errr.....!!!! "A toy for me, mummy?" Sweet of Chris to get you one!!! 😉 I had one but passed it to my mum. Wayyy too heavy for me! It’s brown but harder leather-you know me lol! Just looked at it again and may take it back with me :p only thing is the lock’s missing now, although truth be told, i walked around with it half open when i actively carried it. Getting to your phone’s hard when it’s locked up or even properly strapped in! Oh met a gf using a vermilion colored one today. Can’t wait to see your orange one! I knew it! When i saw your previous entry! 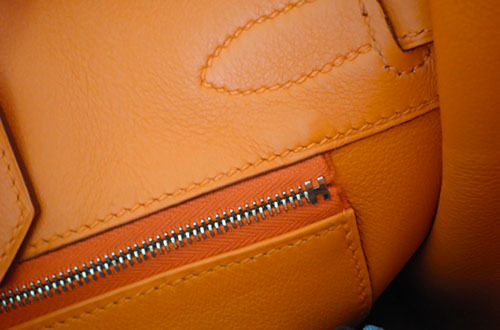 Orange is such a beautiful colour, and swift leather seems like the perfect choice on a Birkin! Congrates gal! One is never enough. 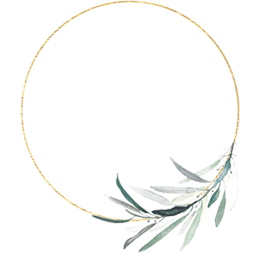 Look at Jamie Chua’s collection. More than a hunderd Birkins and Kellys. Majority of them in crocodile leather. Hee thanks Phyllis.. I’m feeling quite spoiled! Aww you’re so lucky! Beautiful bag!! your matching birthday gift is on its way!!! Wow! That’s a very impressive present from a very generous husband. Beautiful. We don’t often celebrate occasions with actual gifts, so this will last me happily for a long time, hee! THanks hon! It wasn’t from a boutique in SG, but shipped from the USA 🙂 I have seen Birkins here in SG boutiques too though.. Thanks Stefanie, and hehe.. you guessed right!! Its beautiful! Looks great on you in that picture you styled with the jeans. Bet you’re going to stroke it for years to come.. Lol! And you know me too well.. in fact, stroking it on the couch right now, HAHAH! I’m totally ENVIOUS(: Chris is such a generous hubby! 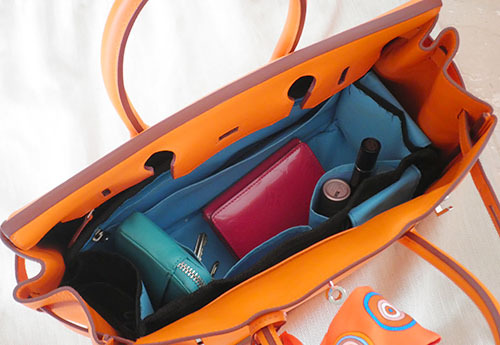 I love the lindy in orange but want my birkin to be black. One can only dream. lol. Baby steps. . .Will save for my bags as my husband already think I have enough. hehe. . The Birkin in black would be a real classic 🙂 And you can pass it down to your daughter too! Nice bag!! I love this bag in this colour too! Such a lovely colour! You have a great husband and you have great taste too! What a perfect birthday present. I knew it was a matter of time before you finally got the ultimate bag. 😉 No freaking out on Hunter for chewing on the tasty Birkin? My favourite part is the detail with the monogram. So thoughtful and personalized and your own little secret. 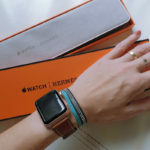 Can’t wait to see more pics of you out and about with your new accessory! HI, remember you have this beautiful birkin and thought of getting your opinion. How’s your swift leather holding up? Does it get scratches easily? I am hesitating on getting a swift leather. I love how light and waterproof it is but just not sure how easily it will get scratches.